Annika Taylor races cross-country at this year's World Cup finale in Quebec City. Taylor will spend the summer training in Norway before gearing up for another World Cup series, followed by the Winter Olympics next February. When Great Britain’s Olympic team walks into Pyeongchang Olympic Stadium for the opening ceremony of the 2018 Winter Olympics, one of the team’s athletes will enter with deep ties to Truckee. Annika Taylor spent her childhood skiing around Squaw Valley and Truckee, and on the heels of finishing her second season competing in the International Ski Federation (FIS) Cross-Country World Cup, she has qualified to compete in four, cross-country skiing Olympic events for the British Nordic Ski Team. Taylor’s main focus at the Olympic games will be the women’s 10-kilometer freestyle, but she’s also qualified for the skiathalon, classic sprint, and 30-kilometer classic. Taylor was born in the United States, but because her father is from the United Kingdom she holds dual citizenship. At 2 years old, she started skiing, following around her older brother and parents on the trails and slopes around Truckee. By age 5 she began racing competitively, and soon after, she began making a name for herself on the junior circuit. She then moved onto skiing for Truckee High School, finishing her time there with three California Nevada Interscholastic Ski and Snowboard Federation championship titles. Taylor then attended the University of New Hampshire, where she earned a degree in chemistry. She earned All-America Second Team honors in her final year at UNH by finishing seventh at the NCAA Championships Women’s 15K Freestyle, and concluded her career there as a two-time team MVP. Taylor then accepted a spot on the British Nordic Ski Team and began racing the World Cup circuit for the 2015-16 season. Taylor struggled early on as she adjusted to competing against skiers at the highest level. Gone were podium finishes she was used to capturing, instead, Taylor found herself in an unfamiliar position — trailing behind deep fields of skiers. “I went into a defeatist mode a little bit on my first year of World Cup. Racing for 60th place, the numbers just really get to you,” she said. After her first season competing in the World Cup, Taylor decided to make the move to training full time in Europe. She was able to track down a family friend, who lived in Norway, and had spent time in Truckee about 20 years ago. After Taylor reached out, the woman agreed to let the skier stay with her and her family in their home in Lillehammer, allowing Taylor access to world-class training partners and a chance to take her skiing to the next level. In May of 2016, she hopped on a flight to Lillehammer. She didn’t know anyone in the country, and the only bits of Norwegian she knew were a few words and phrases gleaned from an app on her phone. Over the course of the year, she picked up Norwegian, joined the city’s elite racing team, traveled Europe for training sessions, and began finding her groove among the world’s best cross-country skiers. “It was kind of learning how to have fun in races again,” Taylor said. “Learn tactics and try something new in races. It became more fun this year. 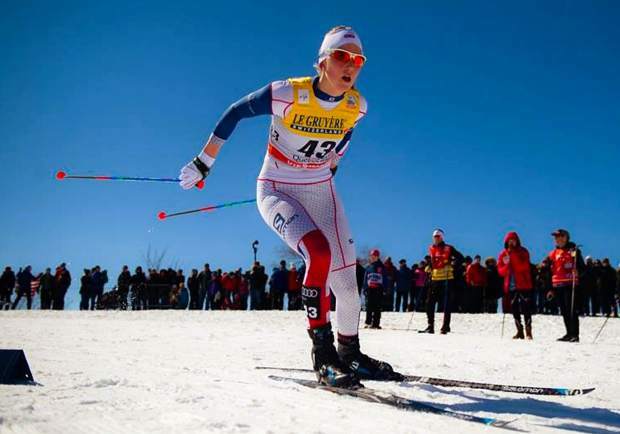 During the season, she competed in her first FIS Nordic Ski Championships and finished 38th in the 30-kilometer freestyle. Taylor went on to close out her World Cup season in Quebec City on March 3, and finished in 47th place in the overall standings. At 24 years old, Taylor is still young in the sport. She said women don’t typically peak in cross-country skiing until their early 30s, giving her plenty of time to grow as a competitor. At the upcoming Olympics, she said her goal is to finish in the top 30. To prepare for the ski season this fall, Taylor said she will continue training at Lillehammer, with stops around Europe to compete in roller skiing competitions. She’ll get back on the snow for the first World Cup events in November, and then head to South Korea for the 2018 Olympics in February. During her time in Norway she has relied on the help of her parents to offset the costs. Taylor has since launched a crowdfunding campaign on dreamfuel.me to help pay for training as she prepares for the upcoming World Cup season and Olympics. To donate to Taylor visit dreamfuel.me/campaigns/159.